We all know he lives in Lapland, specifically in Rovaniemi, where you can go and visit him in his office. 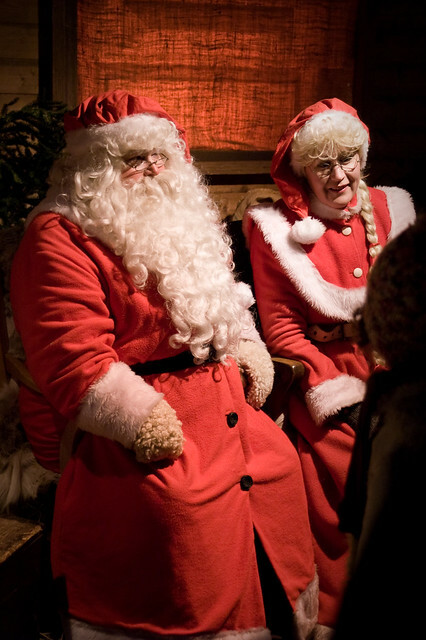 Santa Claus and Mrs. Claus in their Lapland house. Source (CC: by)If Lapland is too far away for you this year, but you still want to tell Santa Claus your Christmas wishes and make sure your letter reaches him in the Arctic Circle in Finland, you’ll need to know how to write to him. Thank him for last year’s presents, even if they weren’t 100% what you asked for. He has to handle a global operation each year after all. And don’t ask for too much! If you need something – a bike to ride to school with, something warm to wear for the extreme cold of winter in Finland – make sure to tell him that. He prefers to read that you wish for things you need, not just want. Joulupukki in Helsinki, measuring this girl’s back to send her a fitting coat. Source (CC: by)All those tips were given to me by Joulupukki in person, so if you want to be on good terms with him, tell him that you are friends of Big in Finland and you’ll get the VIP treatment. Good luck with this year’s Christmas gifts! This is our list of 12 ideas of Finnish Christmas presents, to give you inspiration. May Santa Claus and his Tonttu be generous, and you a good girl or boy. I am no longer a child, but if I were I would ask Santa Claus for two things I now need: two plane tickets to go to Finland and a job in Finland for mid-July 2017. I thank you for giving me a ray of hope .